I'll come right out and admit it. As a 16 year old kid in 1992, there was no way I was going to escape being a Soundgarden fan. Despite some poor late-career albums and Chris Cornell's ill-conceived solo dalliances, I have secretly been hoping for new music from the band. On November 13th I get my wish as a reunited Soundgarden release King Animal, their first studio album in sixteen years. From the outset of "Been Away Too Long", the record shows promise. The grimy guitar groove and tumbling drums make you nod and say 'yes, yes you have been away too long'. That's reinforced by the renewed passion of the hustling, Dead Boys-esque "Attrition". It seems like old times again with "By Crooked Steps". The reins are off Cornell and he is given leave to wail until his heart's content...or until his throat can't take it anymore. The Kim Thayil-penned "Non-State Actor" is free-flowing metal reminiscent of the Louder Than Love era. The lead single, "A Thousand Days Before", features complex Middle Eastern rhythms woven into the arrangement. The most remarkable quality of King Animal is how is reminds me of how under-rated Ben Shepherd's bass work is. It's hard to stand out as a bassist, but time and again he manages to add a little flourish here or an unexpected run there, which brings an incredible richness of texture to the songs. The problems that plagued Down On the Upside rear their ugly heads again here. There are too many filler tracks, and too many uninspired cuts. "Blood On the Valley Floor" is a generic grinding hard rock song. An awkward flow makes "Bones of Birds" difficult to listen to. Cornell sounds downright whiney on "Black Saturday", then gloomy, but never threatening on "Taree". 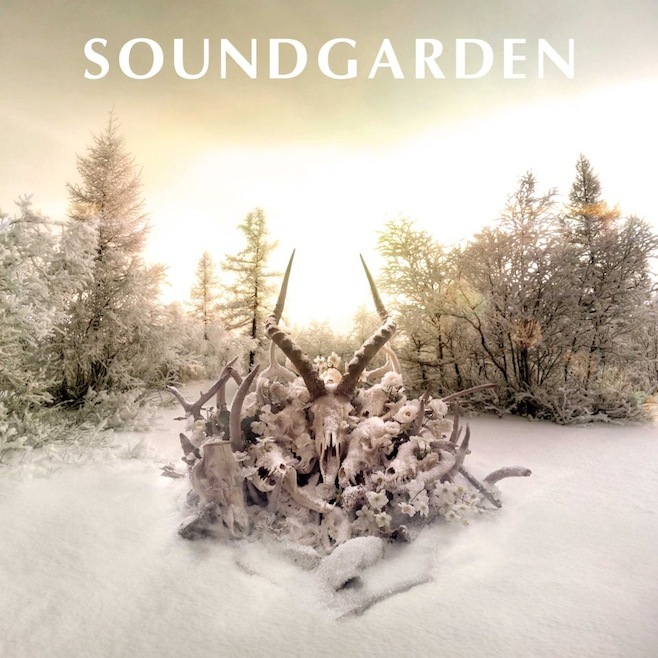 It's great to have Soundgarden back. They fill a gaping hole in the musical landscape right now. However, King Animal needs to be a bit tighter and a bit more concise to be declared a true triumphant return. Soundgarden play The Phoenix in Toronto on November 16th. Best tracks: "Been Away Too Long", "Attrition"
Chris and the boys still have it. Heavy chops supporting delicate and complex melody. I expected the worse, instead it's a pretty decent album! Yes, it reminds me a lot of Down on the Upside, with its highs and lows..except for the modern productions it may be a Down on the Upside Pt. II_Who knows, maybe most of the tracks were D.O.T.U. leftovers. Anyway, even if the old times of masterpieces like Louder Than Love and Badmotorfingers are long gone, it it a good album. 6,5 it's the perfect rating. Steph.